ICE buses leaving migrants at city bus stops or on a sidewalk. PHOENIX, AZ — Greyhound Lines Inc. is no longer allowing U.S. authorities to drop off immigrant families inside bus stations, forcing those who have been released from custody to wait outside until they have a ticket. ICE for years has dropped off migrants at Greyhound stations, largely in Phoenix, after releasing them pending court hearings to decide whether they can stay in the country. From the stations, they travel to their intended destination in the United States. Greyhound spokeswoman Crystal Booker said the Dallas-based company is experiencing an "unprecedented increase of individuals" at certain bus terminals and that travelers need tickets to get in. She said the policy applies to anyone who lacks a ticket. "Our priority is to safely and efficiently get customers to their destinations," Booker said in a statement. A huge number of Central American families have traveled to U.S. in the past few months, many who say they are fleeing violence and plan to seek asylum. Others say they are escaping extreme poverty. In Arizona alone between Dec. 21, 2018, and March 5, ICE said it had processed for release about 14,500 people who came as families. 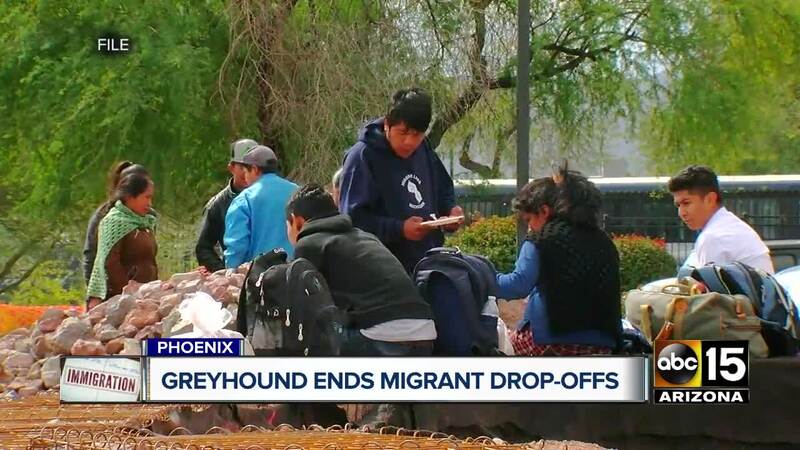 Connie Phillips, president and CEO of Lutheran Social Services of the Southwest, said she doesn't blame Greyhound for its policy but rather immigration officials for not having a long-term, sustainable way to deal with releasing migrants. "Just dropping people off in a place that's not meant to be able to welcome and assist them is not a solution, and we have to work together to create a viable response to this increased need and stop this chaos," Phillips said. Immigration authorities say they release families at bus stations only when volunteer groups run out of space. "ICE wants to mitigate strains placed on resources in the local community as we continue to see high volumes of families crossing the border," spokeswoman Yasmeen Pitts O'Keefe said. Phillips said dozens of volunteers have created a network to respond to the bus station in Phoenix when immigrants are dropped off. They bring food and water, allow migrants to use volunteers' cellphones and help coordinate travel. Phillips said the groups that help out are able to temporarily house about 700 people in churches and congregants' homes in the Phoenix area, but that doesn't suffice. The practice of dropping migrants at Greyhound stations isn't limited to Phoenix, but it's where it happens most often. In San Diego, ICE takes families directly from a Customs and Border Protection station to a shelter run by non-governmental organizations. Authorities have dropped off migrants at the bus station only in some cases. In McAllen, Texas, migrants are dropped off at a Catholic Charities shelter.